1. To make harissa, place dried chillies in a small heatproof bowl. Pour over 1 cup of boiling water and stand for about 10 minutes until softened. Drain and set aside. 2. Preheat grill to high and place capsicum skin-side up and cook for 10-15 minutes or until skin is blistered and darkened. Place in a bowl and cover with plastic wrap. Cool for 10 minutes. Rub off skins and discard. 3. Process capsicum, fresh chillies, soaked chillies, ground cumin, ground caraway, garlic, sugar, oil and ½ tsp. of salt in a food processor until smooth. Season with salt and pepper. 4. Rub lamb with harissa paste. Stand at room temperature for 30 minutes to marinate. 5. Preheat oven to 180. Place the quinoa in a sieve and rinse under cold running water. Place in a bowl and cover with water. Set aside for 20 minutes to soak. Drain. 6. Place the quinoa and 1 cup of water in a medium saucepan. Bring to the boil over high heat. Reduce heat to low and simmer for 15 minutes or until tender and liquid is absorbed. Separate with a fork and set aside to cool. 7. Heat 2 tbs. oil in a non-stick frying pan over medium-high heat. Add lamb, fat-side down, and cook, turning on all sides, for 5 minutes or until browned. 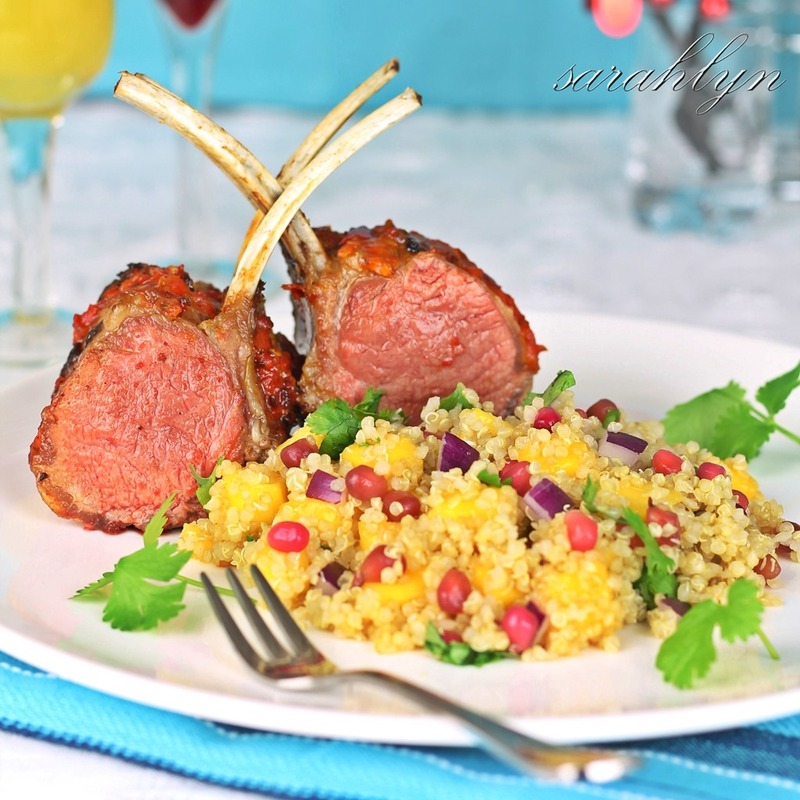 Transfer lamb racks to a roasting pan. Roast for 20 minutes until lamb is medium or until cooked to your liking. Rest lamb for 10 minutes. 8. Meanwhile, combine mango, pomegranate seeds and onion in a large bowl. Add quinoa and gently toss to combine. Drizzle with lemon juice. Season with salt. Lastly, toss in the coriander leaves. 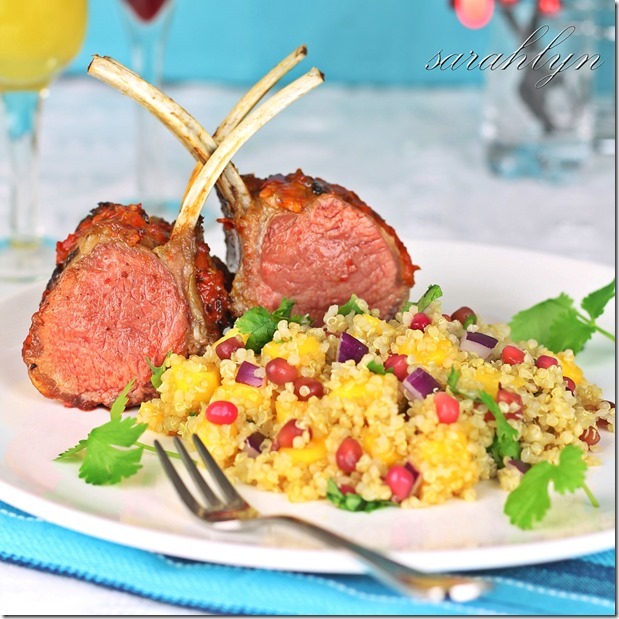 Place lamb on serving plates with quinoa salad. Garnish with coriander leaves. Note: Add more chillies to make it spicier and fewer chillies to reduce. If fresh mangoes are unavailable, substitute for frozen mangoes (thawed) or canned mangoes.